Mr. Judeh was appointed to the Senate (Upper House of Parliament) of the Hashemite Kingdom of Jordan on July 9th, 2017. Judeh served as Minister of Foreign Affairs (later Minister of Foreign Affairs and Expatriates) from February 2009 to January 2017 also becoming Deputy Prime Minister from 2015 to 2017. Upon leaving office on January 15th, 2017, Minister Judeh was the longest serving Foreign Minister in Jordan's history, having served in that post for almost eight years. 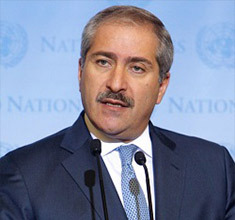 Minister Judeh previously held several cabinet and cabinet-level offices, serving as Minister of Information (1998-1999), Minister for Media and Communication (2007-2009) and Official Spokesman for the government of Jordan for several terms (1998-1999, 2005-2007 and 2007-2009). During his term in office as Minister of Foreign Affairs, Mr. Judeh travelled the world to promote Jordan’s bilateral relations and to participate in regional and international meetings. He presided over the United Nations Security Council during Jordan's two-year non-permanent membership on the Council, 2014-2015. Throughout his career in public service, and particularly as Minister of Foreign Affairs, Mr. Judeh worked tirelessly and passionately to address the key challenges facing the Middle East region and the world, at the heart of which is the pursuit of peace between Palestinians and Israelis. Finding a political solution in war-ravaged Syria and addressing humanitarian spillover, as well as dealing with the danger and threat of radicalization, extremism and global terrorism were also key challenges he worked on during his tenure as Foreign Minister. Mr. Judeh advocated and continues to advocate His Majesty King Abdullah's vision of peace, dialogue and political solutions to regional and international issues, and promoting the true message of Islam as a religion of peace and openness.